SKIATOOK, Okla. — Tulsa County Sheriff's Office officials are rescuing several animals on a property in Skiatook after they found 31 emaciated animals. Officials said a passerby alerted authorities after they saw a horse up to its neck in an icy pond in the 2500 block of East 126th Street North Saturday. 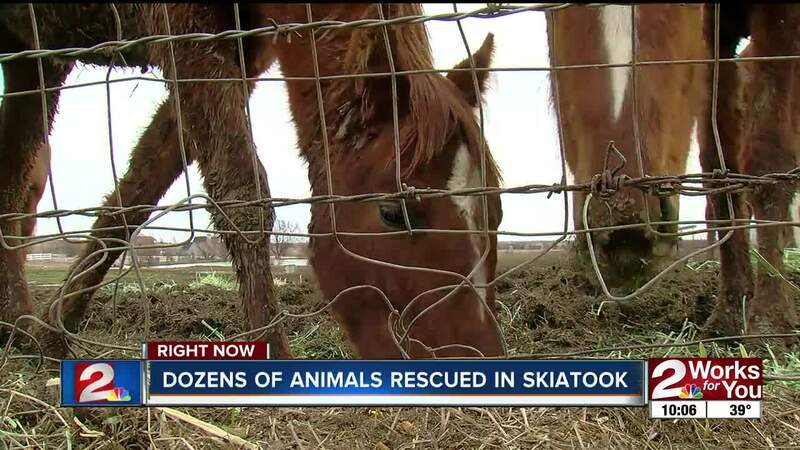 Two Skiatook officers were able to rescue the horse, officials said. Along with 28 horses, deputies also found 16 dogs and three pigs on the property. "There was decomposing horse remains on the property, and it appeared some of the dogs had been feeding on them," officials said. "There wasn’t very much hay or grass on the property, and the only water was in the frozen pond." Officials said the property owner was not being cooperative and told them to "get a warrant." Deputies were able to get a warrant and will collect the animals sometime today, officials said. The homeowner is now facing animal cruelty charges.